This blog is for all the friends and families of injured athletes. Less than a week after my last injury, a good friend invited my best friend and me for a drink. My left leg was bound up in TED hose, wrapped, and braced from ankle to thigh. My knee was in pieces, literally. I was looking forward to a drink or three and getting my mind off the pain. Still in the midst of processing my injury, and wondering how I went from mountain bike racing to completely broken, I hoped my friends wouldn’t carry on with insufferable training and race prattle (which I would have happily contributed to were I healthy). I was greeted with a few jokes about messing my leg up good. I can laugh about it now, 33 months later; at the time, I wanted to curl up in a laundry basket in a dark corner of my closet and cover myself with a blanket. As I had expected and feared, the evening’s conversation was racing and training, training and racing—marathons, half marathons, Ironman races, Half Ironman races, on and on ad naseum. I wanted to bolt, but an escape wasn’t in the cards—I couldn’t even drive. I’m not sure I spoke more than ten words the whole night. I remember looking at my best friend with desperation—can we please change the subject?! It seemed my conspicuous leg brace and I were invisible. I managed to hold it together for the ride home, but I lost it after I lay down to sleep. My friends didn’t mean to be insensitive. They didn’t know what to say. They didn’t realize how hard it is to listen to endless chatter of training and racing adventures as a newly minted gimp. They did the best they knew. If you have a similar story, you’re not alone. During my research with injured athletes, two themes emerged: first, most recounted some version of this vignette; second, athlete friends were among the least supportive. Why? Athletes fear injury. By supporting an injured friend, an athlete becomes exposed to what they fear the most. Time together is typified by silent awkwardness. Neither of you knows what to ask for or what to talk about. It’s no surprise that many athletes chose to avoid this situation altogether. 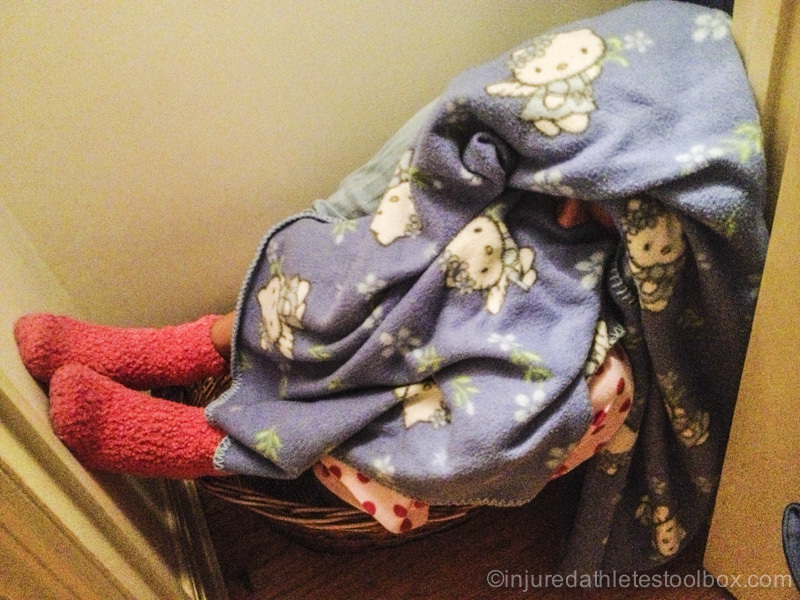 We can all be difficult when we’re injured, but caring for an injured athlete carries additional challenges of helping someone who: feels like they’ve lost their identity; feels disconnected from their social network (training buddies); and has lost the ability to cope with stress in the absence of regular exercise. Your injured friend transforms into an unpredictable live wire. Your first instinct may be to run away. Don’t. Reach out. Then, don’t stop reaching out. When your friend talks, listen—and keep listening. Don’t interrupt. Don’t formulate a response while your friend is talking. Just listen. This sounds really easy, right? It’s not. In fact, research shows only 5% of the population are consummate listeners and thoroughly engage all brain regions that process voice, words, and sounds while listening . We know when someone is a great listener—they precisely hear both content and tone of voice—and we can rest easy knowing that we will be heard. Alas, such folks are uncommon . What if you’re part of the other 95%? You’ll have to work hard to practice your listening skills. Remember, listening earns trust. When it’s time to contribute to the conversation, what can you say? How about, “Describe the thoughts floating around in your head” or, if you sense hesitation, “Tell me more” works nicely to open up conversation. I’m going to the grocery store. What can I get you? Tell me two things you need help with this week. I’d like to come over and take your dog on a fieldtrip. What can I bring you for dinner tonight? Pick two rooms in the house you’d like cleaned and I’ll come over to help. Most of your friends will have acute injures that heal in short order. Some will have lasting, chronic injures. Sadly, our society doesn’t do chronic. In a culture where being busy is a badge of honor, we forget about our injured friends after about three weeks. Be the friend that checks in and helps at the beginning, but who also shows up after three weeks. Bring the Friday happy hour to your friend; rent a movie; pick up dinner; spend an evening chatting. For many athletes, injury means disconnection from training groups that serve as social networks. See to it that your friend doesn’t drift into isolation, but don’t goad them into training before they’re ready. When your friends face injury, find time and make a pleasantly persistent effort to reach out, providing love, support and a listening ear. You never know when you might be on the receiving end. Be the help you deserve to receive someday. Nardi, D. (2011). Neuroscience of Personality. Radiance House. Los Angeles, California. page 118. Nardi, D. (2011). Neuroscience of Personality. Radiance House. Los Angeles, California. page 13. Personally, I need for people to avoid minimizing when they interact with me about injury (or any trauma for that matter). The pat answers of “you’ll be fine” and “you’ll be back to [insert activity] in no time” are largely unhelpful. These responses feel insincere and, I think, go hand in hand with listening. When people are unskilled at listening, they are primarily waiting to say their pre-crafted response in order to move out of their own discomfort and awkwardness. Yes. Yes. Yes. You bring up something I experience over and over and hear about from clients. Since our society squirms in the presence of mental states that deviate from contrived happiness, people tend to dismiss or invalidate the pain of trauma. Most people are visibly uncomfortable being with a friend or family member who is processing trauma. In order for someone to truly be supportive, one or both of the following must be true: 1) the person has experienced trauma, and 2) the person must be inherently empathetic. Largely, people are uncomfortable seeing loved ones suffering and in pain. The best they know is “you’ll be fine” and “you’ll be back in no time.” Little do “support” people realize that suffering is the birthplace of passion. I divide people into two groups. The larger group contains acquaintances and people outside the inner circle. I excuse all those people from whatever they say, telling myself, “they’re doing their best.” I have conversations with my inner circle when they say things that aren’t helpful, so they can learn how to be supportive and encouraging. That way, my energy is invested in people who are truly invested in me. Before I rolled my ankle and ended up in a boot my friend and I were checking in on each other’s workouts. We’d text what we did each day. Now that I’m unable to do anything she still texts each morning. I don’t want to cut her off but I do wish that she would come to the conclusion on her own that maybe I’m not the one she should share her workouts with. Is it normal to feel this way? How can I ask her to stop sharing her post-workout reports with me? Thank you for reading my blog, Trina. I’m sorry to hear about your injury and the boot. I actually have a blog about surviving time in a boot here. You bring up a good question. First, you ask if it’s normal to feel this way. I don’t like to label feelings because they’re neither right nor wrong. They just are. Some people feel like you’re feeling and others don’t. Some people feel like your feeling one hour and don’t feel that way the next! We can only control the way we feel and react to things, so as a start, I suggest taking the opportunity (either on your own or in therapy…I recommend Internal Family Systems therapy) to explore why your friend’s workout updates area a trigger for you. You can do this by asking, “OK, so why does this bother me?” over and over until you get to the heart of the issue. For example: The issue is you’d like your friend to stop sharing her post-workout reports. Ask yourself, “OK, so why does this bother me?” You’ll get an answer. Then ask yourself again, “OK, so why does this bother me?” You’ll probably face some uncomfortable, taboo feelings (jealousy) when you do this, but stick with it and get to the end until you can’t answer the question anymore. What you think you’re feeling is probably frustrated and angry, but what you’re *really* feeling is likely jealousy, resentment, sadness, fear, etc. You need to feel all the feelings. That’s how you get through this. You can also print out my blog and share it with her after you’ve had a conversation about it.